Most parents pack snacks in their kids’ lunches including granola bars however it’s simple to make homemade granola bars and easier on the budget. Healthy snacks for lunch don’t come cheap and if they do it’s because they were on sale or you might have had coupons that brought the price down. Quaker granola bars are just one example of what you might find at the grocery store which are popular with the parents and the kids for lunch snacks. There are so many brands of granola bars these days it’s hard to keep up. If you’re lucky you might find them on sale for $1.99 but I’ve seen them upwards of $3.99 a box. You can make homemade granola bars at home for a fraction of the cost and yield more in comparison to what you find in a box off the grocery store shelf. I like to send my children to school with healthy snacks that I know they will eat and trust me when I say these homemade granola bars are kid approved. Although my kids enjoy fruits and nuts on their own they also like the homemade granola bars that I make for them. I often wonder if sometimes other parents realize just how easy it is to make homemade snacks for the family rather than bulking out their grocery budget with pre-made snacks. Once you get the hang of baking and learning new recipes you might just find that you skip the snack aisle at the grocery store. If you frugal like us keep an eye out at the bulk store for coupons and great sales on bulk foods such as oats, honey and dried fruits. I’ve busy in the kitchen as usual whipping up some more treats for the kiddos because I make homemade recipes whenever possible. The other week I made for you the oatmeal jam squares but today I’m sharing with you my secret recipe for actual homemade granola bars. I like my granola bars quite crisp but you can make homemade chewy granola bars simply by not cooking them for as long. My kids love this healthy snack and every week I make a batch of homemade granola bars for them to take to school and for other functions such as a pot-luck or family get-together. I like these healthy granola bars myself and you can essentially add all sorts of nuts and dried fruits to make custom granola bars that suit you. If you fancy a bit of sweetness there’s nothing wrong with adding a few chocolate chips to the mix either. 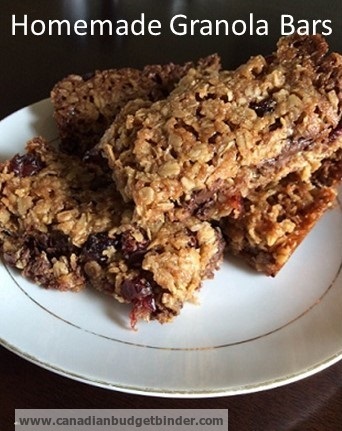 Granola bars are a great energy boost and you can add just about put anything in them. I always like putting frozen fruit in mine so that I can change the bars every week. We also love coconut so there is always a handful or two added for that extra bit of crispness. If you like a peanut butter granola bar add in some peanut butter and enjoy a splash of peanut in your homemade granola bars. Now that the school term is coming to an end I will be doubling up on my baking treats as they are always hungry over the summer break. What you will enjoy the most about this easy granola bar recipe is simply how effortless it is to make. I will also be making my cinnamon buns for the kids to take to school for their last day of school. They have been asking for ages if they can take some to school as every time I put one in for a treat their friends ask if they can have a taste lol! I don’t think I will have any spares that day! Homemade granola bars will be what your family craves once you make this easy granola bar recipe. Mix all the ingredients into a bowl except the syrup/honey. 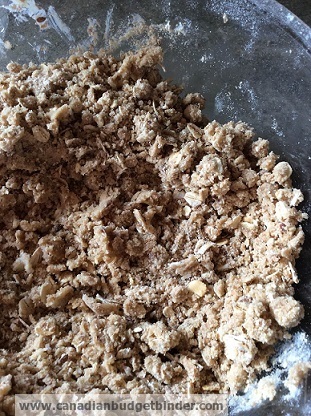 Make sure the dry ingredients and butter are mixed well and resemble breadcrumbs. Now add the syrup/honey and mix well. I find using my hands gets the best results! Place in a 7" x11" greased pan (or line with parchment) and press firmly with back of metal spoon. When you take them out of the oven cut into bars and leave to cool in the pan. There you have it, some great homemade granola bars that you can make in a jiffy to satisfy your sweet cravings. The homemade granola bars are also great to make with the kids as they get to mix the ingredients with their hands and it’s fairly simple. Keep in an airtight container for up to a week but I’m sure they won’t last that long in your house. I am away to have mine now with a great big cool glass of homemade lemonade Mmm! I had an attempt at making a whole batch of these Granola bars last night and I can safely say it was a success, unlike the Lemon Meringue pie I tried the other week. These granola bars now have my breakfast covered for the week! Addison they always taste better when you make them yourself ! They just don’t last long so a double batch is always a must in this house! Okay so soon I’m going to go for a 115-mile bike ride. Probably in the next 2 weeks. I think I’ll pack a few of these bars for the trip! Good luck on the. Ike ride! Definitely need a few of these to keep you going on that! Woah, that picture looks super tasty. I haven’t had breakfast yet, so I just became about 100 x hungrier! Thanks for sharing this recipe! I’d love to dedicate more time to making weekly snacks like this. They always taste so much better than store bought. Mmmm looks good! I eat granola bars all the time, so it’s nice to have a recipe to make my own. I often make peanut butter/chia seed bars. They are so filling! I think it’s great to make these things yourself as so many things from the store have so much sugar/chemicals. Melanie totally agree with the ingredient side! Way to much other ingredients get added to a bar that it relatively simple to make and tastes delicious! These look so good, and relatively simple to make 🙂 I know what’s going to be on my list for this week! They are really easy and so yummy! This one is a great snack to definitely add to your weekly bake list lol!